If you go to Motorcycle Week in Laconia, NH make sure to take a break from partying to enjoy the beautiful riding in the White Mountains. 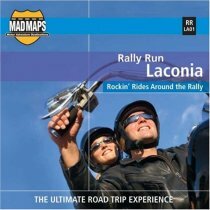 Click here here to buy your MAD MAPS Rally Map. Click here for the official Laconia Motorcycle Week website. Click here for the Laconia Motorcycle Week – Images of America – Photo Book.